Samantha Wildman was married to a Ktarian named Greskrendtregk and became pregnant with his child shortly before leaving Deep Space 9. 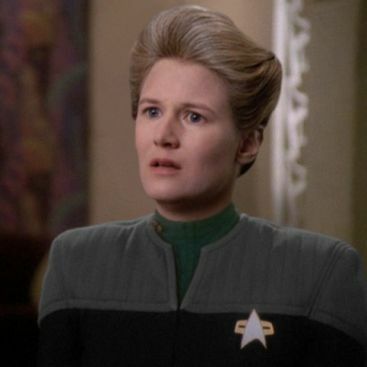 By the time she discovered her pregnancy, Voyager was already in the Delta Quadrant. She experienced many difficulties with this pregnancy, her first, including shooting pains in the lower back and the legs. There were complications during the birth, and the child died. However, a subspace accident had duplicated Voyager and the duplicated child was returned to Samantha when her counterpart was killed. The child was later named Naomi. After the Kazon captured Voyager and stranded the crew on a primitive planet called Hanon IV, Ensign Wildman's baby became ill and died. Ensign Wildman was one of the most loyal viewers of A Briefing with Neelix, the daily news program hosted by Neelix in 2373. In 2374, Ensign Wildman was part of a team headed by Seven of Nine, a group that prepared a harmonic resonance chamber to neutralize omega molecules; Wildman was assigned to bring the power relays online. On an away mission, the Delta Flyer, crewed by Wildman, Tom Paris and Tuvok, was damaged by an ion storm, crashed, and was buried under rock on a deserted planetoid. Wildman was seriously hurt, bleeding internally. Just before the air was depleted, the Flyer was dug out and transported to Voyager, saving the crew. In 2378, Samantha was reunited with Greskrendtregk when Voyager returned to Earth. Six months later, she and her family attended Voyager's relaunch ceremony, and by that time she was promoted to the rank of Lieutenant and assigned as Assistant Chief Science Officer. In 2379 she transferred to the same position on the Lexington in order to serve with her husband. Shortly after arriving in the Delta Quadrant Wildman found out her husband slept with Lieutenant Ilia while M'Rajni was in heat. Despite the mitigating circumstances Wildman sued for divorce. It was then that she learned her daughter did not die on Hanon IV but had been alive the whole time.